T here are dozens of restaurants in San Miguel de Allende that have been around for years. They're big and little, upscale and down, good, great, and well, you might want to eat at home. You'll find many of the best reviewed on our restaurant pages. But there's been a strange phenomenon of late. With all the new people and new money moving into town, the rate of restaurant openings has skyrocketed! It seems like every week, at least one new restaurant sighting is reported. We want to keep you informed, but we don't, in general, review restaurants that haven't been in business for awhile. We don't like to recommend a place only to have readers show up to find shuttered doors. We like to see a track record. Enter the "New Restaurants Watch" page. This is where we'll pass on some of the most interesting sightings of new restaurants in San Miguel —whether we've tried a place ourselves or just heard about it from others—with thumbnail reports from early diners. If a restaurant stays on the scene for at least six months or so, we'll take it off this page. If we like it, we may turn it into a regular review with a page of its own. It's too soon to endorse these places completely; they haven't yet proved themselves to have sticking power. But we'll give them a showcase here and let the market (i.e. YOU) decide. We'll also keep you up to date on restaurant closings, changes in management or menu, and any other restaurant news we think you'd like to know about. So stay posted here for new hot spots, cheap eats and dining experiences. There's always something interesting going on in the dining scene with new restaurants in San Miguel. May, 2009 - There are several good Italian restaurants in San Miguel de Allende. There are also a few good take-out and home delivery places. Now there's both in one location. Romolo y Paco has just opened at Calle Vicente Araiza 100 (just two blocks from the Mega super-store) as a take-out and delivery option making really fresh, hand-crafted Italian food, using authentic Italian products. One chef, Claudio, is from Rome, the other from Spain—hence the paella on the menu ($100 pesos for a full kilo). The buzz on this new place has been amazing and deservedly so. The cheese tortellini with eggplant/zucchini sauce was beyond good (and a great vegetarian choice). A friend who tried the ravioli with pink vodka and peanut sauce was also blown away. Puttanesca sauce, bolognaise, and the four-cheese sauce have all been mentioned with awe. Most dishes run between $50 and $80 pesos. April, 2009 - My favorite San Miguel restaurateur (and good friend) Juan Villaseñor has opened a second location. His fanatic followers have taken to calling this one "The Other Ten Ten Pie." But it's a little different from the popular terrace cafe and hang-out on the corner of Cuna de Allende and Cuadrante. The new location is at Stirling Dickinson #5, on the right as you go up from the Ancha de San Antonio, just before PetVet. Outdoor tables in a garden-like setting make a nice atmosphere. The breakfast menu is the same as the other location, but the rest of the day it's quite different. The clue is in the name. Al carbón means charcoal-grilled, and that's the specialty here. The arrachera, a favorite beef cut with me, is tender and delicious. The grilled fish is fast becoming another favorite. And the chicken kabobs are tender and moist, marinated in chimichurri then skewered with onions and red bell peppers, grilled and served with rice. Hours are daily, 9 am-9 pm. March, 2009 - Here's a new concept: For a 250-pesos-a-month subscription, you can get one liter of hearty, healthy, home-made soup delivered to your door every week. That breaks down to about $US4.50 per liter--including delivery fees. Owner Laura Hernandez personally makes the stock for every soup at "Soups By Subscription." She uses local, organic produce whenever possible and adds fresh herbs and vegetables she grows in her own garden. February, 2009 - This new "brew pub" is getting some rave reviews. I haven't checked it out myself yet, but the feedback I'm hearing includes: "A new contender for the best burger in town," "Their American Pale Ale is low in foam and very tasty," "The patio is shady and a nice place to spend a couple hours on a hot afternoon." The various beers on the menu are brewed to order for them in Guadalajara and include a mild wheat beer and a creamy stout. Also on the menu: wood-fired pizza, sandwiches, cheddar and bacon on the burgers if you want it. And blooming onions! For those who don't like beer, I'm told they have amazing Tuna Margaritas. That's not nearly as weird as it sounds. "Tuna" is the Spanish name of the prickly pear cactus fruit—and it's delicious. Hmm, think I'd better go get me one of them tuna margaritas! Cerveza de San Miguel is about one mile past the Fabrica Aurora on the road to Dolores Hidalgo, just before the intersection with the Libramiento. February, 2009 - Sadly, this perennially popular spot has closed. There was a big closing night party a week or so ago and owners Dave and Patrice Brucia have moved back to Phoenix. They'll be missed and we wish them well. The restaurant was left fully equipped, so perhaps someone will reopen it soon. We'll keep a watch and let you know. January, 2009 - This may become my new favorite breakfast spot in San Miguel. For those days when I'm craving a real "American" breakfast, I can get freshly ground coffee with refills, eggs "al gusto," bacon, country potatoes, and bread with butter and blackberry jam. And all for $50 pesos. The coffee is really great, but it's the hot chocolate that pulls me in on these chilly mornings. It's real and made fresh, a mix of American and Mexican chocolate. Cafe Buenos Dias is also open for "comida," the main Mexican meal served at mid-day. Soups and sandwiches by the fireplace make for a lovely interlude on a winter afternoon. The waiter/host is an old friend, Juan Carlos Rodriguez, who many will recognize from his years as head waiter at Cafe Santa Ana at the Biblioteca. Good food; great value. With Juan Carlos' warmth and hospitality and the lovely food and ambiance, this place seems a shoe-in to become one of my (and maybe your) favorite restaurants in San Miguel de Allende. January 2009 - I've not yet tried this new place on Insurgentes between Quebrada and Hernandez Macías, but the buzz is that it's "quite good... and quite reasonable." Arrachera is one of my favorite Mexican cuts of beef—a super-tender and flavorful flank steak, usually sliced thin and grilled—so I'm looking forward to trying this one. This definitely falls into the "Cheap Eats" category with a plate of arrachera served with rice and salad costing $65 pesos (less than 5 bucks at current exchange rates). November, 2008 - A fine and cheerful addition to the restaurant scene is Donovan's. Cheerful because as soon as you walk into the long, narrow room, your senses are "attacked" by joy by the high peach-orange walls and the flood of sunlight from the big, high windows. 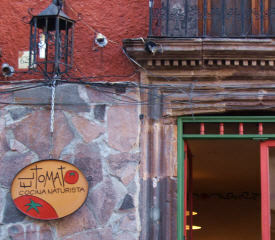 The owner/chefs, Juan and Emma Ramírez, have years of experience in other restaurants in San Miguel and it shows. Everything I've tried was fresh, delicious and lovingly presented. And cheap! A full breakfast will cost you about $45 pesos; dinner can range from $50-60 pesos up to about $150 if you really indulge. My favorite dish so far is the chicken fajitas. Or is it the home-made pasta? Well, maybe the pizza.... And the desserts, made by Emma's sister, Antonia, are sinful. There's even live piano music some evenings. It seems destined to become one of the most popular restaurants in San Miguel. January, 2009 - I'd come to this place just for the name—"El Cafe de Nadie (es el Cafe de Todos)," which translates as "The Cafe of No One (is the Cafe of Everyone). It's a nice little place inside the Instituto Allende. 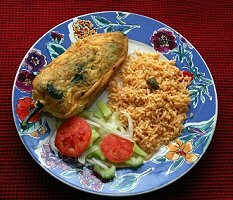 Norma Suarez features home-cooked food, including lots of vegetarian choices. Really excellent coffee, delicious muffins, and some of the best prices in town. Her complete comida del dia is only $40 pesos (less than US$3). See? Cheap eats in San Miguel are not a dream. English is spoken. This is not a new restaurant. In fact, it's been a staple in many San Miguel vegetarians' arsenal for years. I've gone in often for their smoothies and a big salad. But El Tomato belongs here because it's now under new management. Mariano Álvarez and Wendy Vazquez Maria are still offering great healthy-eating options with lots of salads, fruit, pastas, soy dishes and high-energy drinks. Full courses include some tuna and turkey dishes along with the vegetarian choices. There's a daily special each day that includes a yummy home-made soup. The potato-leek-and-carrot soup might be the best you've ever tasted. This small, casual deli-type cafe is just up the street from the Sazon Kitchen Store. I've heard several raves about it. Others have said the portions are a bit small to justify the prices. You'll have to decide for yourself about that, but here's what I've heard. The sandwiches have a "gourmet touch" and are served on really good, home-made bread. The chicken salad is a favorite with many, served with a green salad. Also, great smoothies and pastries. This is planned as a dynamic page, always changing as new places open and are added to the page and older ones drop ff—either to move to our regular restaurant reveiws pages or to disappear into oblivion. So check back often to see what's new and hot on the scene of restaurants in San Miguel de Allende.